Production of the iconic Land Rover Defender might have stopped in 2016, but there's potentially a new successor on its way from petrochemicals giant Ineos. Modelled on the classic Land Rover Defender, the new 4x4 is the brainchild of Jim Radcliffe - founder, chairman and chief executive of Ineos. Ratcliffe plans to build the off roader in Britain if he's granted financial support from the Government, in addition to funding the project with £600 million of his own money. There's currently a competition running to name the car, which has been codenamed 'Projekt Grenadier' after the Belgravia pub where Ratcliffe recently unveiled his plans. Mr Ratcliffe is a fan of the - now discontinued - Land Rover Defender, but doesn't hold out much hope for Jaguar Land Rover's updated Defender in two years' time. The company founder ensures his design won't just be a Chelsea Tractor. The Grenadier aims to combine extensive off-road capability with better reliability. While not much is known about what the 4x4 will look like, Ratcliffe says it will be available with petrol, diesel or hybrid powertrains and will create 7000 jobs. He claims that his new car company will build 25,000 4x4s within the next three years - rolling off the production line by 2020 - which will be modelled on the Defender as the design is not currently trademarked in Britain. However, Jaguar Land Rover - which plans to launch an updated version of the Defender in two years' time - say the original design has been registered in many countries and a trademark application is currently pending in the UK. Ineos has priced the Grenadier at about £35,000 and has identified a number of potential sites in Britain on the east coast - from Scotland down to the northern city of Hull. Ratcliffe believes Britain is where the heritage lies, but admits there are cheaper alternatives in countries like Germany where the workforce is already trained and Ineos could use existing sites. 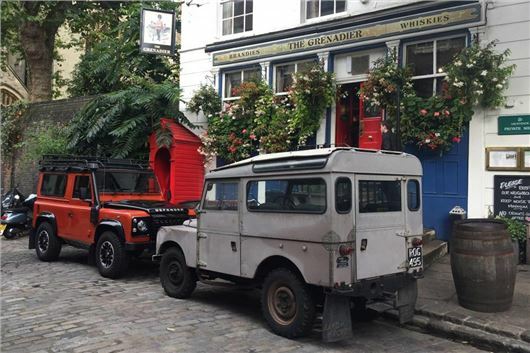 Speaking to HonestJohn.co.uk, Jaguar Land Rover said: "The Defender will always be instantly recognisable as a Land Rover. Jaguar Land Rover is aware of Ineos' intent to make a 4x4 but has no details of the plans including the design for the vehicle; we have no objection to competition. We will however, monitor closely any actions in relation to our proprietary rights in Defender." Priced at about £35k ? But doesn't want it to be a Chelsea tractor ? Bearing in mind that the Mitsi L200 is priced from £21k, the Isuzu DMax from well under £20k.